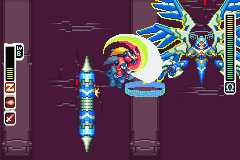 The purpose of this page is to document all the known tricks of the GBA Mega Man Zero games so far. Because of the nature of this site, we concentrate here on tricks that are nearly impossible to perform in real play, but are useful in the making of tool-assisted speedruns. For most of the tricks, a frame advance feature in an emulator is a definite must-have. Note: "Zero" on this page refers to the player character Zero, unless the context clearly indicates otherwise. GBA Mega Man Zero (USA) in 17:03.95 by Rolanmen1. 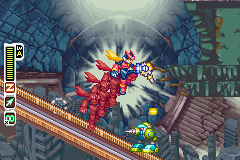 This is the first Mega Man Zero game in the series for the Game Boy Advance. Unlike most other Mega Man games, Zero really is not in the mood for fighting all the bad guys, and decides to call it quits in the first few missions so that he can skip ahead to the last stages. This run beats the previous run by 1.76 seconds. If you liked this movie, be sure to check out the all stages run. GBA Mega Man Zero (USA) "all stages" in 34:09.83 by Rolanmen1. After a long hibernation meant to purge his body of the Wily Virus, Zero is awakened to save Ciel and the resistance. Zero decides to help, but what he really wants is to have some slashing fun. Unlike the other run of this game, this run doesn't use mission skips, which means that the author had to beat every mission as fast as possible. This improves the previous movie by 1.91. GBA Mega Man Zero 2 (JPN) in 50:54.88 by computerbird. Zero is back in his second personal adventure, facing his greatest challenge yet. This time, the Japanese version is used instead for a glitch only available on that ROM. This run beats the previous run by 8 minutes and 23 seconds. Sonikkustar has done some live commentary on Ustream as well. GBA Mega Man Zero 3 (USA) in 58:00.98 by computerbird. It features mostly the same gameplay as its predecessors, but with a different Cyber Elf system and customizable armor. Also new are the Secret Disks, which can be analyzed for information about the series, enemies, items, and the characters. This run is over 2m30s faster than the previous version. GBA Mega Man Zero 4 (USA) in 37:07.48 by klmz. This run is almost 4 minutes and 20 seconds faster than the previous movie, in spite of having over 30 seconds more text due to game version differences. A large part of this improvement is due to new combos. Also, the invulnerability times of midbosses are abused even further with midair wobbling of the Z-Saber or the Z-Knuckles. For more details, see the run's comments. See also: the forum disscusions on these games. You do not have to be right up against a wall to wall-jump; you only need to be within a few pixels of the wall. So it is possible to wall-jump when right up against the wall, and then wall-jump again as you ascend away from it, allowing you to gain extra height. Usually, damage animation interrupts and overrides Zero's current animation being played. As long as the damage animation is shorter than that interrupted, it is a time-saver because you can deliver a second attack or another move sooner. This is a common trick in many games. In many games, damage causes the player character to become invincible for a short time, even to spikes. While by now this is nothing special, there are situations in the Mega Man Zero series where using this can save you from having to acquire certain equipment in order to reach an item or take a shortcut. You can also climb spiked shafts rapidly without using platforms if there are enemies around. A rarely necessary trick, when Zero is damaged, Zero is forced to move away from the source of the damage, even if there is a game event during which Zero is incontrollable. 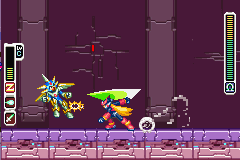 This has been useful in MMZ4, where you can defeat the boss in Area Zero with ground attacks from one of the top platforms in the room, receive damage from its attack at the same time, and afterward fall off the platform during the immobile period, to save time. Unlike that of the sequels, the combo system of MMZ1 is not implemented with attack levels. The first two slashes of Zero's triple ground slashes and air rolling slashes cause on bosses a short invincibility period that is only 12 frames long, while the finishing slashes result in a much longer invincibility period. Therefore, it is possible to perform a very long slashing "combo" with such slashes that only cause a short invincibility period on a boss. If you insert a weapon into a slot where a different weapon being charged, the status of the charging progress of the replaced weapon will be inherited by the inserted weapon. This allows firing two charged shots or slashes one after another with the same weapon. If the collision box of your attack stays overlapping that of an enemy, the attack will no more hit the enemy after it has hit the enemy once upon contact, unless it is multi-hitting by design. However, if you move the collision box of the attack out of the enemy, it will be able to be hit again. Typically, you can do a jumping slash next to an enemy and keep turning to the left and right while still in the air, to make your slash hit the enemy for multiple times. This does not work if the enemy has boss-typed invulnerability. 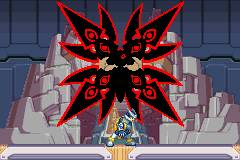 If two or more of Zero's attacks of the same attack level (there is only one attack level in MMZ1) contact a enemy that does not have boss-typed invincibility period, they will alternately damage the enemy every frame they keep contacting it. For some reason, the hot metal ladles seen in levels use some "attack" to inflict damage to Zero upon contact, which is very blockable with Zero's shield from the left and right sides. Thus as long as the shield is being held, Zero can touch, slip or jump on the sides of the ladles without taking damage. A thrown charged shields keeps returning to Zero as long as Zero keeps away from it. 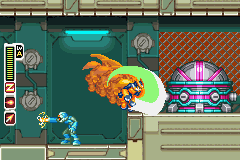 Since Zero can move faster than the shield, it can be abused to hit enemies around as long as possible. However, with careful positioning, you can let the shield just encircle Zero standing still. This is useful if you want to keep the charged shield on alert throughout a dialogue or a scripted event during which Zero cannot move. Chain Rod can be used to attach to and drag items. For some reason, every time its tip hits an item, Zero receives one point of Chain Rod EXP. This can help level up Chain Rod skill very quickly. For some reason, you can quickly skip all intro screens before the title screen with the start button in Japan versions of all MMZ games, while you can't do the same thing in other versions. Anyhow, you can use a game restart sequence (A+B+Start+Select) at the first logo screen (MMZ1-3) or the second one (MMZ4) to skip to the title screen. In Neo Arcadia Shrine, you can jump up the roofs of all of the "temples" and skip everything including the bosses inside them. If you skip any boss fight this way, all of the later bosses will disappear from their rooms, because the scripts of entering the fights will not be triggered. You can keep going onto Neo Arcadia Tower and meet Ciel, but you cannot save the game with her. This glitched journey ends in the room right after Ciel, as none of its exits will open once you have entered it. TODO: There could be a few of them to be listed here lately. Although currently not useful in a speedrun, these glitches may lead to some new tricks or exploits in future. When you stand close enough to vertically stretching spikes, you can dash into them and get repelled without being damaged or dying. When Zero dashes through a very narrow gap that is broadening, which is formed with a stational block and a moving one e.g. an elevator. Such death is counterintuitive because Zero is not crushed, but gets killed in the opposite way. TODO: More of such things?